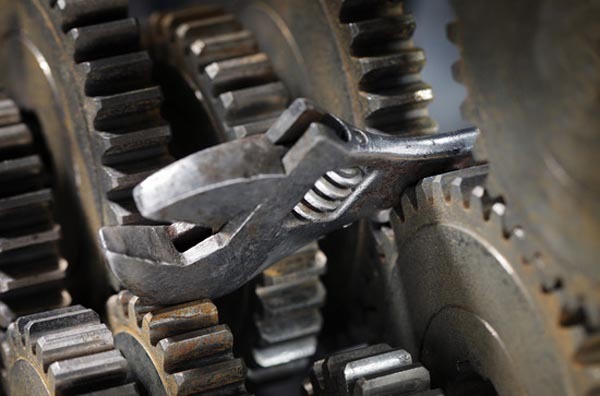 Brexit: a spanner in the works? It is not very often that this blog is accused of painting "an overly rosy picture" about the disruption to the flow of goods attendant on Brexit. And indeed it would appear that I have been somewhat too gentle in one respect of assuming that computer processing eases the burden of customs management, given the huge amount of data that has to be handled by Her Majesty's Revenue and Customs Service (HMRC). However, this is something of a theoretical statement. In principle, there is nothing to stop it being true, as long as the systems are capable of handling the workload. But, as we will see, that chances of that happening post-Brexit would make the prediction of "zero" seem optimistic. The current system, known as: "Customs Handling of Import and Export Freight" (CHIEF), currently 24 years old, is already acknowledged to be inadequate. In May 2010, HMRC formally announced its plans to retire (what has become known in the industry as) "Classic" CHIEF in the summer of 2012. It was to be replaced it with CHIEF STE (strategic technical enhancement). In the nature of Government IT systems, when 2012 came no new system arrived. Instead, in March 2012, HMRC stated "it was likely that the CHIEF rewrite project (Strategic Technical Enhancement - STE) would now be put out to tender". Nothing was then heard until June 2013 when a new Programme Director was appointed for the CHIEF replacement project and that HMRC expected to be re-tendering for a replacement service "as early as the end of this year". By February 2014, however, all that was known was that the system was "being replaced for several reasons including an ageing infrastructure, the current service delivery contract coming to an end, and the new Union Customs Code (UCC) had to be accommodated. It took until April 2014 for an official announcement that, because within the next 7-10 years there would be many EU legislative changes to international trade processes, HMRC had established what it was now calling the Customs Declaration Services programme (CDS), "to look at replacing the current CHIEF service". From 2014 onwards, it had been expecting to focus on changes to the Union Customs Code, "part of the modernisation of customs which will serve as the new framework regulation on the rules and procedures for customs throughout the EU". At the time, HMRC had expected the UCC legislation and changes to apply from May 2016 when the old customs legislation would cease to apply, although there was to be a period of transition from 2016 to 2020 during which the changes will be put in place. It added that some UCC changes would happen before the current CHIEF service was replaced, so HMRC would need to consider how best to handle these services to enable users to meet the new EU requirements. By 2017, it said, the replacement service would reflect all of the UCC changes currently expected and would also be flexible enough to reflect any future EU changes. By then it had emerged that HMRC had decided against launching an invitation to tender (ITT) to replace CHIEF, preferring to use a mix of internal development, commercial off-the-shelf (COTS) packages and external suppliers. In October 2015, it was announced that the timetable for CDS had slipped to the end of October 2017 - a cumulative delay of five years. This, said the ever-patient British International Freight Association, "may sound a long time, but given the time needed to write the technical specifications, which are due to be released to the Trade in February 2016, and carry out testing". The technical specifications did not appear. Instead, high politics intervened in the form of the EU referendum. A certain Alexander Pienaar, representing HMRC on the body's Joint Consultative Committee (JCC) told members in March 2016 that: "The government recommends that people of the UK opt to remain in the EU". But, he said, "There is no contingency plan in place for Customs, HMRC or the government around what might happen if the government fail to secure its desired outcome". Unsurprisingly, after the nation voted to leave the EU, it was being reported in August that HMRC was finding that its advanced long-term planning to replace key systems had become subject to "Brexit uncertainty". In its IT strategy, decided on in January 2016, six months before the referendum, HMRC said its work on CDS would involve finding a replacement CHIEF that will "rationalise and transform the asset base into a modernised, simplified, streamlined and more integrated suite of systems that are easier and more cost effective to maintain, and which also enable HMRC to comply with EU legal mandates". At that point, the CDS programme had a budget of £87.4 million and had been flagged with an "amber-red" warning in Whitehall in 2015 because of the risks posed. Amazingly, this was reduced to "amber" shortly before the Brexit referendum. By now, the deadline had slipped further to 2018 deadline, and even to meet that, the CDS programme was supposed to have purchased and integrated two commercial off-the-shelf software packages by the end of 2016, the very year in which, for planning purposes, a sizeable earthquake was about to rock Whitehall. Officials had planned for CDS to manage up to 100 million declarations. Since the Brexit vote, maximum capacity needs have been revised up to 350 million. Many declarations are verified by customs officers, suggesting a big increase in staff will also be needed. CHIEF, expected to be in place as a backstop during the transition to the new system, was already suffering occasional outages, due to system overload. In July, we were back to the hapless Alexander Pienaar, who was telling JCC members there was "a clear strategic focus on creating a new customs operating model for the UK" (yes, people really do talk like that), but: "The options available will not emerge until we understand the future trade relationship bwtween (sic) the UK and the EU". Two months after the referendum uncertainty remained, with HMRC in the position of "evaluating" its IT, in the light of the referendum. One of the areas this impacted was on how a CHIEF replacement could be scaled to cope with an increase in customs declarations if the UK left the EU customs union. Thus, even within the portals of the HMRC resided that fatal confusion over free movement of goods relating to the Single Market, and membership of the customs unions, leaving the organisation unclear of its direction. As the organisation was forced to point out, "any decisions on future customs arrangements will be for ministers to take" – and the ministers had not yet take the (any) decisions. By October, as the scale of the problem began to emerge, the trade press characterised the situation somewhat succinctly, stating that the referendum result has "inserted a rather large spanner into the works of the contract process". HMRC had been supposed to sign the contract with the declaration system provider the day after the referendum. Given, as it was said rather drily, "the future landscape may well change significantly - with current [maximum] CHIEF operating capacity at 100-150 million declarations per year, against potential post-Brexit volumes estimated at 300-350 million declarations per year - "further discussions were had with the potential supplier". This had the Financial Times reporting that business was warning of the risk of "major disruption" at the UK's borders as Britain struggled to upgrade "a troubled new computer system to cope with a huge increase in customs declarations expected after Brexit". Mindful of the poor history of big public-sector computer projects in the UK, industry groups were raising the alarm over the risk of mistakes in the three-year-old IT programme, which was facing difficulties even before Brexit. In a submission to a government-industry joint consultative committee, the UK trade sector said: "Trade has changed significantly since the 1970s and the concept of rolling the clock back 40 years and introducing frontier clearances does not seem feasible". By now, the CDS schedulling for full migration completion, having originally been set for 2012 and having most recently slipped to "the middle of 2018", was now being said to come on-line by December 2018, just a few months before the UK's likely departure from the EU. Predictably, industry was "seriously alarmed by the administrative test of applying customs checks and separate tariffs to EU trade". It was, the industry said, "difficult to see" how CDS or CHIEF would cope by 2019 with "any substantial changes to what we do now". Desmond Hiscock, director-general of the UK Association for International Trade, was cited by the Financial Times, saying there was growing frustration among his members over the uncertainties and risks. "The existing system will be not be able to cope and there is not much confidence that the untested and still incomplete replacement, CDS, will fare much better". Said one senior Whitehall official: "It is terrifying. But one by one the issues are sinking in". By November, still in the thrall of its own misunderstandings on the nature of a customs union, HMRC was still stalled by the lack of decision on whether to the UK was to remain in the customs union. HMRC had set up a Brexit sub-group. In the absence of progress, though, the MHRC's Alex Pienaar was left uttering platitudes. "There is a strong desire to understand Customs work and engage with trade", he said. It took until January for The Times to copy out the FT story – a fairly normal lead time. This brought Jim Harra, Tax Assurance Commissioner and Director General Customer Strategy, in front of the Treasury Select Committee a month later, to tell us that HMRC was: "still scoping a 'day-one scenario' in the event of no agreement". Scoping but not coping, it would seem - no completion date was given. If those negotiations take zero seconds then there is the entire two year Article 50 period to make adjustments. If however they take up that entire two years then there is a remaining zero seconds. I would tend toward the latter. An ambitious timeframe for a government IT project. So it's no wonder Davis has asked government departments to prepare for a no deal scenario because at present that's the only scenario on which they have enough information to prepare for! As well as the lack or perhaps complete absence of time to do this work, a further difficulty for HMRC is that it is part way through adapting the system to implement UCC processes. Now it must be refocused to implement a customs code which is unique to the United Kingdom and which has the slight disadvantage of not having been written yet. Since it replaces the UCC which comprises a suite of documents 1,300 pages long, this in itself is going to be a challenging task. Says O'Sullivan: "I'd liken situation to an army on the move (from CHIEF to CDS) about to be ambushed (as there’s no time to prepare) by an overwhelming force as the environment in which this system was written to operate will be radically altered, everything it currently does, every function point will be under attack from some change request". He adds: "The chaos and disruption will be war scale". Against this, a mere "spanner in the works" hardly seems to convey the extent of that which is to come. And, if at all possible, it gets worst. HMRC comes to the table with its entire IT system in turmoil, having to restructure its operation under the gaze of the National Audit Office. Struggling to transform itself into a 20th Century digital organisation, HMRC has recently lost its unloved chief digital officer. It would have had difficulty handling the upgrade to CDS even without the intervention of the referendum, embroiled as it is in cleaning up its mess, arising from an abortive IT management project. As it stands, only the wildest optimist might think that, come Brexit "day one" - when the system will be needed to perform flawlessly – we are going to be anywhere near a roll-out. And the consequences are going to be anything but rosy.